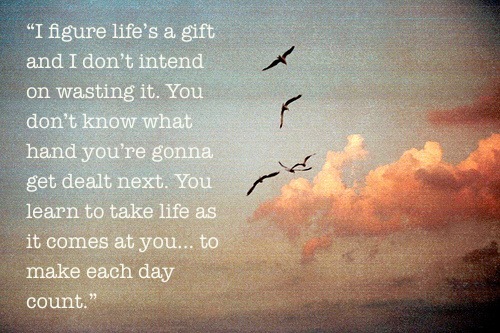 Life is a Gift – Make Each Day Count! So, I’m trying this thing at the moment: releasing the need to control everything. I never really saw myself as a control freak. Then I started care work and it became apparent I have issues. I like doing things my way because I think it’s more efficient and I can do it right. Major ego-trip at work here. I have learned that people also like things done their own way and when there’s a conflict of control, that creates some tension. And at some point, someone has to give. Most of the time I give in because I’m not the biggest fan of conflict – I think this might be an insight into why I feel the need to control everything. I have a natural mediating skill and can diffuse most situations with humour and reminding people of the positives. So I think that by controlling everything I can improve the situation and avert arguments. Except I’m not. I’m not flowing with life; I’m forcing it to work my way. The control freak usually wins. My ego is making itself SO apparent this week! I’m finding fault with everything, which means there’s a fault within me I’ve yet to acknowledge, or at least let go of. It’s hard, but I am DETERMINED to find it and let go of it. So you can see how my thought pattern works. It’s a constant conflict of ego vs higher-self. The higher-self is becoming more prominent, but my ego is putting up a damn good fight. I am grateful that I am actually aware of my ego now. When I find the ego rearing its head I repeat an affirmation in my head. This week my affirmation has been: “I release the need to control everything. I allow the universe to flow and work through me.” I’ve also been asking myself “Does this serve the highest good?” before I do anything as a reminder to be better than I was yesterday, and also to make me think of what actually matters. This journey of relinquishing control has made me realise the paradox of the situation, and it’s a situation only a control freak can get into: I’m trying to control not being in control. And as this realisation dawned on me, a quote from Titanic popped into my head. Jack: “I mean, I got everything I need right here with me. I’ve got the air in my lungs, a few blank sheets of paper. I love waking up in the morning not knowing what’s gonna happen or, who I’m gonna meet, where I’m gonna wind up. Just the other night I was sleeping under a bridge, and now here I am on the grandest ship in the world having champagne with you fine people. And then I realised something else: I already have everything I need. Everything will come in good time when it’s meant to, and in trying to control everything I’m forgetting that I’m ALIVE and that there is a life going on, why am I wasting energy by trying to control the outcome?! I think we all become so caught up in what the outcome is going to be that we forget to enjoy the process in getting there. So let’s take a leaf out of Jack Dawson’s book and take life as it comes at us. Let’s not worry about the outcome – just trust there will be one. And most of all, let’s realise we already have everything we need. Why Do We Feel Like We Need Recognition for Being Kind?